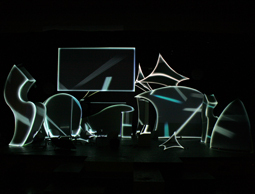 Video projection mapping is a new stage lighting technology, new enough that not everyone calls it by the same name! 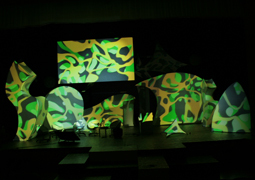 In this project, a stage design composed with white fabric elements by Transformit was precisely projected upon with three-dimensional video from four computer-controlled projectors. 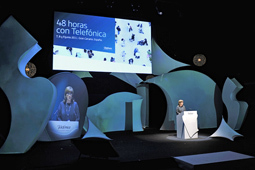 Telefónica de España hired marketing agency QUUM to produce their annual event, called “48 hours with Telefónica.” The event showcased the company’s latest technology for 750 attendees. Lighting is by Vector001, Madrid. 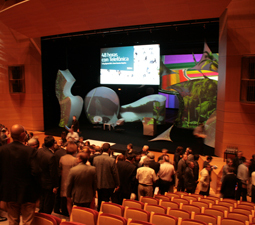 The Transformit stage is by our Spanish partner, Magrada Proyectos, Barcelona. 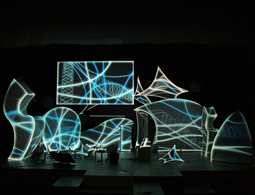 With this project, video mapping technology becomes more than a novelty. It supports the event’s theme, the transformation of the world through the development of social networks and the relentless expansion of Web 2.0, symbolized by wind-borne dandelion seeds. The entire stage was computer-modeled in 3D Studio Max, where Transformit’s 3D CAD models were placed and arranged. The video content was then tailored to each piece. The projection itself was managed in a proprietary program that controlled two 15,000 lumen video projectors for the front of the stage, and two 10,000 lumen projectors for the rear. In between video segments, the stage pieces were lit from behind with LED stage lights. While the technology is new, the cost is reasonable. 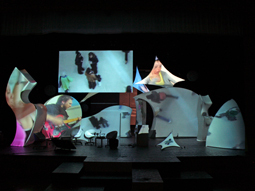 Of course, the video content must be created, and the projectors are costly to rent, but the Transformit pieces on stage are rented, and no printing is required. In addition, the stage lighting cost is actually lower than usual for a stage. Large impact with little waste, and a high degree of design flexibility.